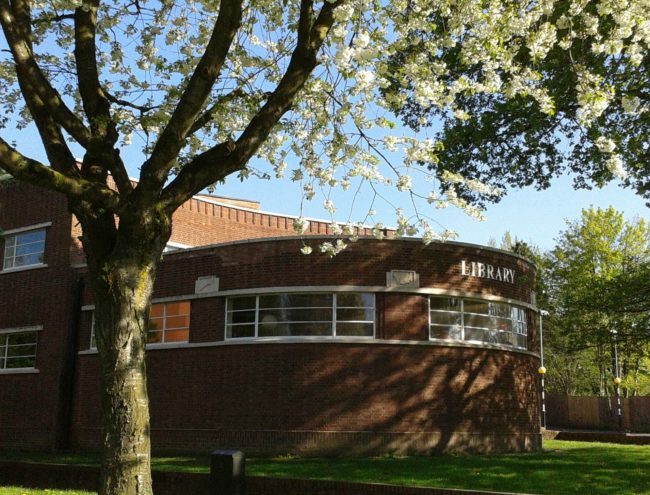 This image of Thimblemill Library in Smethwick framed by tree blossom is how I picture the start of Spring, even if the weather has other plans. The library was built in 1937 in a style that embedded Art Deco details within a pastiche of an ocean cruise liner. Square plaques that illustrate science and artistic themes alternate with metal-framed windows around the curved wall of the library’s senior section. Inside, continuous tall bookshelves line the walls with the windows above them. Glass skylights in the ceiling let more light inside. A new extension was added to the library a few years ago. The bricks and windows were chosen to match the original exteriors as closely as possible. The library sits on one corner of a crossroads junction. On the opposite corner is the last remnant of the 19th century Thimble Mill, a watermill that made thimbles (among other things). The mill gave its name to the library, the pub that stood on the corner between library and mill, and the adjacent road. Thimblemill Road marked an old boundary through an agricultural landscape between Smethwick in Staffordshire and Oldbury in Worcestershire. Where the library now stands was previously a small fire station and a sewage pumping station.